Typically, I practice archery at home. I’ve got a really nice range. The archery butts are a mess. But, a short walk versus and 30 minute drive to shoot at an indoor 18-meter range is a real pleasure. When it is raining I’ll still shoot at home unless it is just too much. With Hurricane Michael bringing wind and rain I decided to make the drive to stay dry. 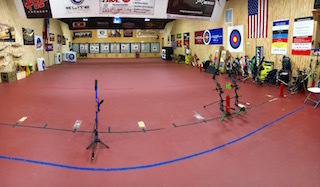 The range,at Social Circle Ace Hardware, is nice, has good lighting, the butts are in pretty good shape and arrows are easy to pull. There’s always a bit of friendly conversation from the pro-staff. It is a bit of a drive but the atmosphere makes up for the hour round trip loss of time. All arrows shot from the same position. It is usual to find a few other shooters at the range. The past two days, I’ve pretty much had the place to myself. 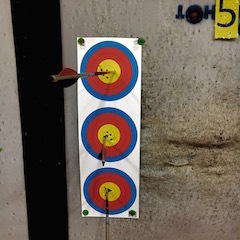 Other archers came in, shot a few arrows and left. I don’t think anyone came in and practiced more than 15 minutes. They seemed to be simply checking out their equipment for hunting.